Numerous adult athletic leagues are offered throughout the year including softball, kickball, basketball, and volleyball. The following leagues are offered seasonally. Please refer to the current program brochure for league play dates and registration guidelines. • Each division is limited to 8 teams playing a 10-game (winter) and 8-game (fall) regular season. • Winter league play begins in January. • The top 4 teams advance to a post-season tournament. Info Packets are available at the Sullivan Community Center or online. Individuals are randomly grouped to form teams each week. A supervisor is on-site to make sure everyone gets equal opportunity to play. Can’t commit to the full program? 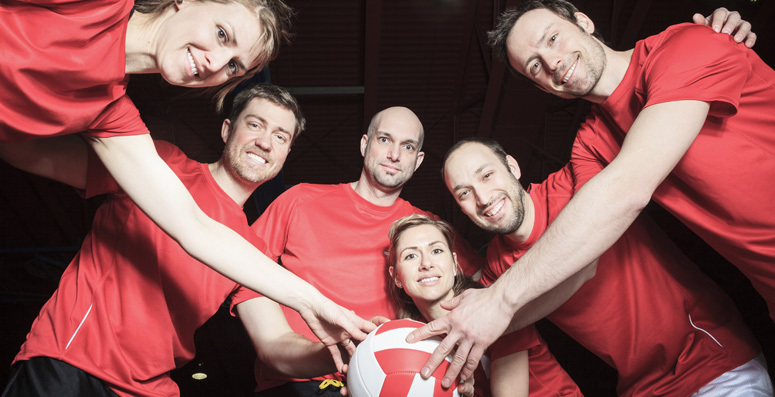 We accept a limited number of daily admissions to the volleyball program. Daily passes will be sold on a first-come/first-served basis beginning at 6:00 pm on the day of the program. • League play is from April 30 to mid August (summer league). • Leagues and days are to be determined. • League champions receive a cash award. • Tournament winners are awarded their choice of a t-shirt or trophy. • All teams play in the single elimination Kickball Kup Tournament at the end of the season. • A cash prize is awarded to the regular season winners.